After this meal appeared on my menu plan, I had several requests to post it immediately. Although not all of the new recipes I try are successful (sadly, so sadly), this one was definitely a hit. The concept is brilliant and the flavors, although simple, are perfect for a light pasta dish. 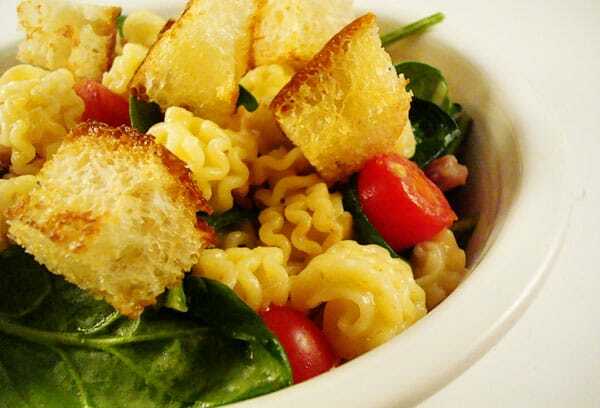 The hints of meaty bacon, fresh spinach and bright tomatoes were a perfect compliment to the tender noodles and salty Parmesan cheese. Do you want to know my favorite part, though? Even more than the snitches of bacon? The croutons. Oh, the croutons. Homemade croutons. Heavenly in their buttery toasted state, I had trouble not snatching the croutons from atop my family’s plates. In a million years, I never would have thought to top a simple pasta dish with crunch croutons, but I have a feeling I’ll be making the adjustment to include these nuggets of love from now on. P.S. This pasta doesn’t save all that well considering the spinach gets a bit wilty (perhaps you like that sort of thing?) and the bacon gets a bit rubbery…so my advice? Eat up while you can. P.P.S. Did I mention this meal comes together in a snap? Less than 30 minutes. I promise. Bring 4 quarts of water to a boil in a large pot. While the water comes to a boil, melt the butter in a large nonstick skillet over medium heat. Add the bread cubes and cook, stirring frequently, until golden brown, 6 to 8 minutes. Transfer to a bowl and wipe out the skillet. Cook the chopped bacon in the empty skillet over medium-high heat until crisp, about 5 minutes. Transfer the bacon to a paper towel-lined plate and leave a small amount of the bacon fat in the skillet (about 2 teaspoons). Cook the onion in the bacon fat until softened, about 5 minutes. Add the garlic and 1/2 teaspoon pepper and cook until fragrant, about 30 seconds. While the onion softens in the skillet, add 1 tablespoon salt to the boiling water then stir in the pasta. Cook until just tender (al dente). Reserve 1 1/2 cups of the pasta water by ladling it into a bowl before draining the pasta. Drain the pasta and return it to the pot. Stir in the tomatoes, spinach, Parmesan, bacon and onion mixture, and 1 cup reserved pasta water. Stir quickly and completely so the cheese doesn’t melt in large clumps. Add additional water as needed. Season with salt and pepper to taste. 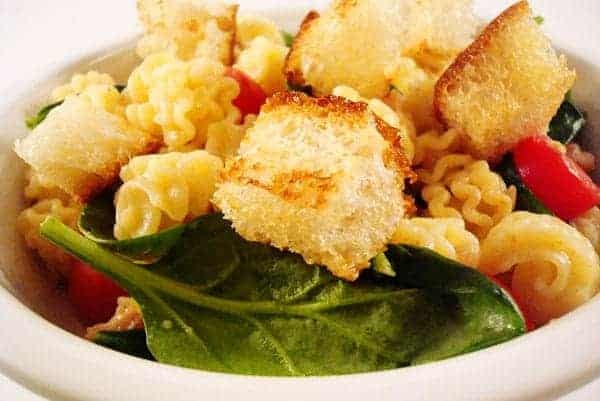 Ladle pasta onto plates or bowls and top with croutons. Serve immediately. Hi Jessica – so glad you liked this recipe. Thanks for letting me know! What a yummy meal this is. I can’t agree more with your sentiments on home made croutons. BLT’s are a favorite around here! Love it in your pasta salad form. I’m making this for lunch tomorrow! I even have some sour dough bread to make croutons with. Superb in its simplicity. Love the combination of ingredients, lots of eye appeal and flavor. Wonderful. Thank you so much for sharing this. It’s a keeper. Great salad! I completely agree with you about the croutons! Homemade is definitely the way to go!! This looks delicious – who doesn’t love a BLT? i will definitely be making this salad and soon! Can’t wait to browse around! Sounds Yummy! Thanks for posting this! What a wonderful dish and great idea! Looks fantastic! Hi. I just love your recipes. I’d like to nominate you for a Beautiful Blogger Award! wilted spinach and rubbery bacon? no thanks. fresh blt salad? brilliant idea and oh-so-enticing! oh i so want to make this!!! THANKS!!!! I agree… homemade croutons are the best… this dish sounds delish!!! Ah, I can’t wait to try this out. But it’s going to have to wait until I finish out my 2 week meal plan. Arg. Maybe I can do some rearranging. Nuggets of love! So Funny! 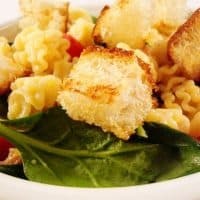 Croutons with pasta! Who’d a thunk it? Bet it was delicious. I’ve been eying this recipe in the magazine. Guess I need to get it made now. This looks yummy! Did I miss the recipe for the ciabatta loaf? Sounds so good! Thanks for the great recipes! Yay! Thanks for posting – I can’t wait to try it!! I love, love, love a BLT…it’s my all-time favorite sandwich, so I’m definitely going to give this pasta a try! Thanks!